Director: Rupert Everett. 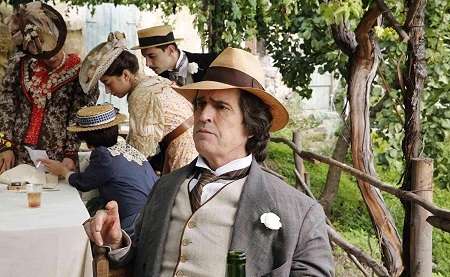 Cast: Rupert Everett, Colin Morgan, Edwin Thomas, Colin Firth, Emily Watson, Anna Chancellor, Julian Wadham, Tom Wilkinson, Antonio Spanguolo, Franca Abategiovanni, Béatrice Dalle, André Penvern, Thierry de Coster. Screenplay: Rupert Everett. Twitter Capsule: Everett brings conviction to all his tasks but his skill with direction and montage fall well short of his goals. VOR: ② Less dry and more formally ambitious than Wilde, but Rupert's Oscar is less persuasive than Stephen's. All a bit familiar.